I’ve been working on a new bra design with a back closure and more structured cups, in between being distracted by the new puppy and my secret art project. This bra is one I’ve been contemplating adding for a long time. Simply put, it is the classic cut and sew style bra that can work for a range of cup sizes. As I’ve written about before, not all styles can be graded to fit or work for all cup sizes. 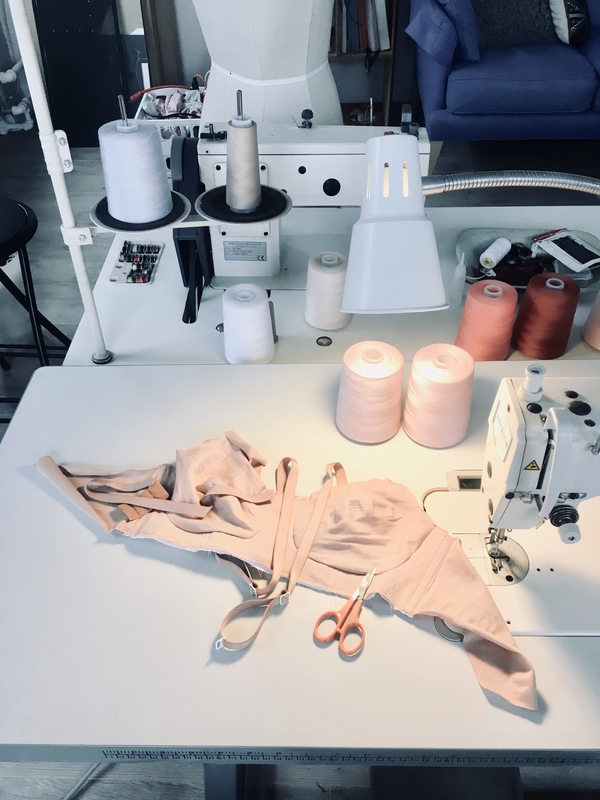 Technically, yes, a triangle bra can be sized to work for a D, E, or F cup, but it likely won’t be effective at support or shaping, or provide customer satisfaction- which is why we don’t make it in larger sizes. The last item is one that is much requested which I have debated as to how to answer. We have not as of yet been able to find a way of producing sustainable or organic foam cup liners. While organic foam has made its way strongly into the mattress industry, it comes preformed with 1/4″ wide holes cut through it every inch or so on a grid. No doubt this provides breathability for a mattress, but repurposing as cup liners is impossible because of the holes. The next thing to try is casting organic latex foam into molds- which we are still looking for. If you know anyone producing a castable organic latex, please send them our way! Thus the compromise. We won’t be selling the cup liners, but you can bet that amazon does 📬 We’ll just put an organic cotton pocket in place so you can use them.